Peacefully at the Northumberland Hills Hospital in Cobourg on Monday, September 10, 2018, Pat Gofton-Carey at 82 years of age. Born in 1936, Middlesbrough England. Loving mother of the late Karen Brown, James Gofton, grandmother of Mark, Adam, Brent, and great grandmother of Dayton and Clara. Dear sister of Barbara, Bev, the late John Lawson and sister-in-law of Joan. Will be sadly missed by cousins and lots of nieces and nephews “Near and Far”. Pat served in the W.R.A.C. reserves 1954-1956 and married Tom Gofton in 1956. They had 32 years together before he died in 1988. 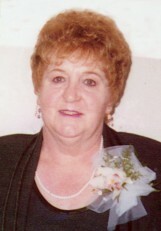 She remarried in 1998 to Ron Carey who passed away in 2009. Pat loved dancing, gardening and cooking (Made the greatest Sherry-Trifle ever). Her favorite saying was “I did it, my way”. A Celebration of Life Service will be held at MacCoubrey Funeral Home, 30 King St. E., in Cobourg on Wednesday, September 19 at 1 pm with reception in the funeral home reception centre. Interment of cremated remains to follow at Cobourg Union Cemetery. Those wishing may make a memorial donation to the Northumberland Hills Hospital Foundation. Condolences received at www.MacCoubrey.com. Wednesday, September 19 at 1 p.m.